So remember those 4 Itoh Intersectional Peonies on Ebay I purchased last fall? Well, they turned out to not be intersectional peonies at all. All four of them were some nameless single flowering herbaceous roots that the seller misrepresented as much more valuable intersectional peonies. I have purchased intersectional peony roots from a different seller on Ebay in previous years that were actually intersectional peonies. This seller, bernard*sweety, sold me expensive intersectional peony roots, but actually sent me cheap herbaceous roots. As you can see I was able to successfully dispute the charges with my Discover credit card. However I also had to talk with Paypal customer service because I had also used a $25 Paypal gift card on this purchase. So all told this seller, bernard*sweety, tried to defraud me out of over $160. I am not the type of person to take that sitting down. As soon as I saw the foliage come up in the spring, I knew it was herbaceous foliage, not intersectional foliage. So I opened a dispute right away and gave Discover all of the required dispute documentation (and then some) as evidence. I also wanted to let all of you know in case you are thinking of ordering something from this seller, bernard*sweety, don't! I'm not saying I won't ever order peonies on Ebay again. However I will be much more leery of what they're selling. 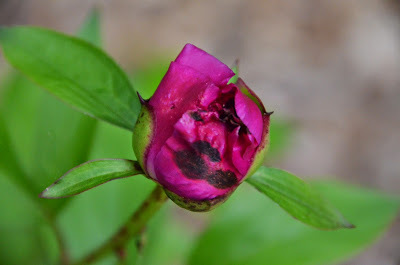 If I want a peony that is guaranteed to be the correct variety, then I will definitely order from a reputable peony grower that stands behind their roots!